Posted By:Unknown | At:6:47 AM Be the first to comment! HOUSTON (Reuters) - Texas Southern University removed 10 students from its marching band and suspended them from the university for hazing, the latest college to investigate allegations of hazing among band members since last year. The school, which did not provide details on the hazing, said on Tuesday the students will also lose their band scholarships which could be as much as $10,000 a year per student. The students may appeal the sanctions, it said in a statement. The sanctions come at a time of heightened attention to hazing following the hazing-ritual death last year of drum major Robert Champion at Florida A&M University. Twelve band members have been charged with third-degree felony hazing, and all pleaded not guilty. The university president and the band director resigned. Last month, North Carolina Central University in Durham said that the 36 members of its marching band drum line must attend a hazing-prevention workshop and perform community service after an investigation into hazing allegations found that members had violated the school's student code of conduct. 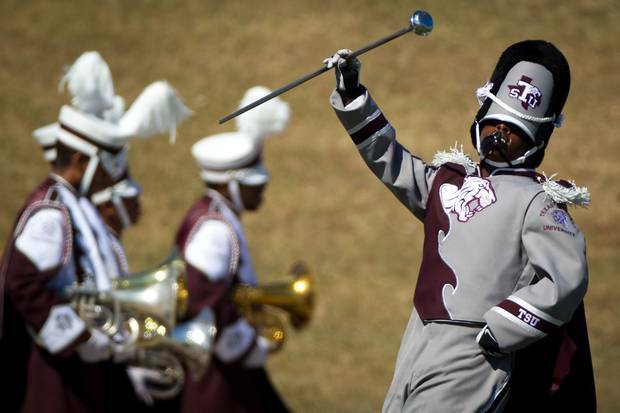 Texas Southern's award-winning band, Ocean of Soul, which has played in several Super Bowls, has not performed since the university last month suspended the organization while the school investigated allegations of hazing reported by a student. The 9,500-student Houston university said the sanctions should send a message that the school has no tolerance for hazing. The university is "taking the incident very seriously," said spokeswoman Eva Pickens, who did not describe the nature of the hazing. The rest of the 180-member band will not be suspended but their performances will be restricted, the university statement said. A Thanksgiving Day parade performance will be canceled, as will a trip to Atlanta for a band competition. Band members will also have to perform community service and attend anti-hazing workshops.